While walking along the sidewalk adjacent to Crescent Harbor last week, I happened to catch sight of something brown and not vegetation-like in the salmonberry bushes growing beside the path ahead of me. I managed to stop before I flushed the Song Sparrow perched on one of the branches. As I watched, the bird chewed on a swollen green bud that appeared close to opening. Although I tend to think of Song Sparrows as ground-feeding seed eaters, I have on a previous occasion noted a Song Sparrow eating the still-green seeds of saltbrush (Atriplex gmelinii). Prior to this individual, I do not remember seeing a Song Sparrow eating greens, however. I continued to watch, and the sparrow sang a little bit, but not its full song, as it kept its bill mostly closed, though I could see its throat moving in time with the soft chirps and trills. After a little bit of singing, it moved up the branch and really went after one of the buds. Shortly after this, I caught sight of a quickly moving bird down in the rocks. The Song Sparrow in the bushes noticed also, and directed his attention toward where the second bird had flown. Upon seeing the second bird appear again from the rocks, the first one flew down to the rocks as well. 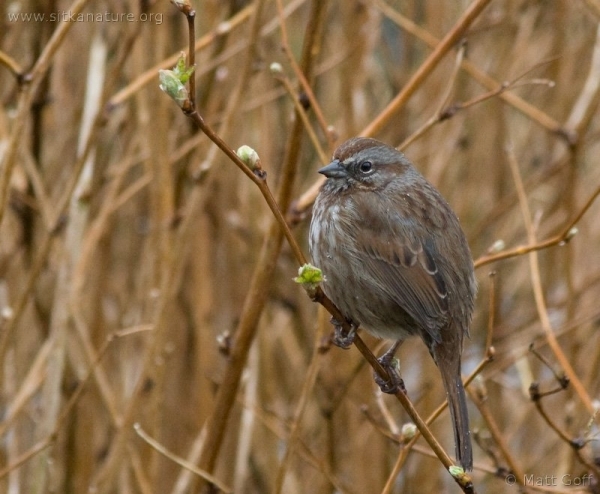 I took a look at the branch where I had seen the Song Sparrow chewing at the buds. Despite the vigor with which it appeared the bird was chewing, the marks seemed subtle to my eyes. I took a photo of the bud that appeared to have the most obvious damage, but even that I suspect I would find difficult to notice unless I looked for it specifically. Curious about the eating habits of Song Sparrows, I looked up the food habits of Song Sparrows on the Birds of North America Online Song Sparrow account. From that I see they also frequently consume invertebrates and fruits (which does not surprise me, I probably should have realized that myself). However, it does not mention them eating greens. 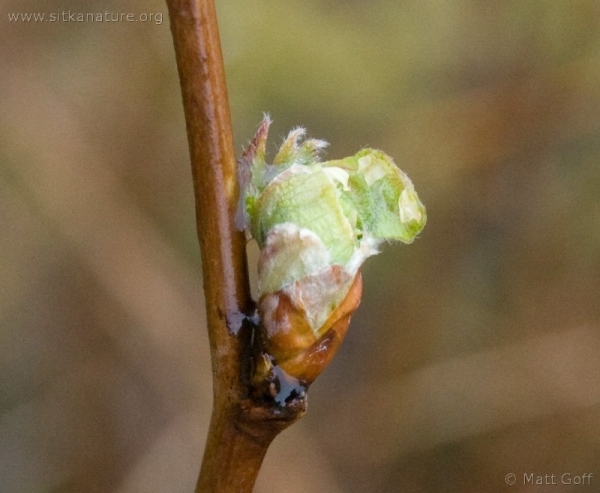 Update: Someone pointed out to me that insect larvae could utilize the buds, and perhaps the Song Sparrow was going after them. I’ve not noticed such insect larvae (or evidence thereof), but that’s probably because I haven’t been looking. This entry was posted in birds, flora, photo, tracks and sign and tagged feeding behavior, Rubus spectabilis, Song Sparrow. Bookmark the permalink.